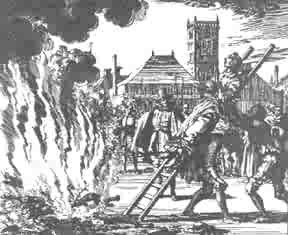 This Sunday marks the anniversary of the birth of Anabaptism. It was on that date 482 years ago that my spiritual forebears broke ranks with Zwingli and baptized each other in defiance of the European church-state alliance. Like Daniel, they turned down a king’s table and dared to challenge his orders. They realized that God was not converting the world but taking out a people for His name. They realized they were not left behind on earth to save civilization. The ship, they knew, was a wreck, but they could rescue some of the passengers. They were identified with a Person, not merely a principle, a philosophy, or a program. They were not perfect people, but they were different. They were called “Re-baptizers” in ridicule and derision, but they had made their decision to follow Jesus, and there was no turning back. They had no secret plans for retreat should the going get tough. They knew they must forget the things that are behind. They let the dead bury their dead. They put their hand to the plow and did not look back. They set their face like a flint. They burned their bridges and their boats. They followed Joshua into Canaan and never considered a return visit to Egypt or the wilderness. They lived in a day of unification, unanimity, and uniformity, a day when it was fashionable to secure the endorsement of the clergy. World-state and world-church projects abounded. All this they resisted, for the most part in a peaceable and humble fashion. Their red-hot devotion showed up their enemies’ pale zeal and rebuked their lukewarmness. The result was wanton slaughter. But persecution made a good grindstone. They kept their message distinctive to the finish. Instead of compromising their beliefs about a regenerate church, believer’s baptism, church discipline, and every-member ministry, they stiffened their backbones and endured hardship as good soldiers of Jesus Christ. They did not merely believe the bank was trustworthy, they made the deposit. They did not merely assent to the soundness of the bridge, they crossed over. Unless we can recover the original meaning of faith in Christ and get a new crop of genuine believers we are going to have a church as different from the church of the New Testament as head belief is different from heart trust. Today we need to renew the “radical reformation.” We need shock treatment to bring us to a clear-cut yes or no. Our Lord said, “He that is not with me is against me.” He recognized no middle class. Neither should we. It is worth all it costs of self-denial and lion’s dens.